Artless protest? Or a disappointing protest that hasn't yet occupied the agenda of the public or the church? Despite being critical of Occupy Belfast’s media strategy over the past few months, I’m still disappointed when they respond to Peter Robinson’s jibe about their “artless protest” with a press release. Occupy Belfast would like to take this opportunity to say that we will not be going away and will be relentless in our campaign to expose the hypocrisy and spin emanating from the charade on the hill. Press release or imaginative, headline grabbing performance art. Guess I can’t have it both ways? Occupy Belfast started out in tents in Writer’s Square opposite St Anne’s Cathedral and running small scale protests before boldly moving into the disused Stock Exchange building that had once been the Bank of Ireland headquarters. I was going to write that I have two disappointments with the overall Occupy movement. But perhaps, it’s more that I’ve learnt two things from the Occupy movement in Belfast and beyond. Firstly, anarchy isn’t a very fertile breeding ground for a well thought out and incisive message that influences large numbers of people and changes attitudes. And neither is anarchy disappointed at slow progress and minimal impact: the drip drip approach is quite acceptable. Taking over the old Stock Exchange Building has been the most talked about thing that Occupy Belfast have done. It briefly grabbed headlines. It gave them an opportunity to explain themselves on Nolan and Talkback. And then the loose collective and “The People’s Bank” faded from public notice. Where are the public meetings that involve voluntary sector organisations already working in areas that concern Occupy: housing, employment, education? If anything, the First Minister’s criticism has given the group oxygen that may lead to publicity, rather than them creating their own spotlight, despite being a stone’s throw from the offices of two of Belfast’s three daily newspapers. Secondly, churches have mostly been very unimaginative in their response to Occupy. In the case of St Paul’s Cathedral in London, their response was bumbling and ham-fisted. When the Writers’ Square camp was in full swing, I heard Occupy Belfast representatives speak warmly about their relationship with St Anne’s Cathedral. But did that church – as well as all the others around it in Belfast – not miss a trick by ignoring the camp on their doorstep. Without being clichéd, did they not ask What Would Jesus Do? The Gospels are full of Jesus speaking about the poor? Poor in spirit, poor in health, poor in wealth, poor in societal standing. 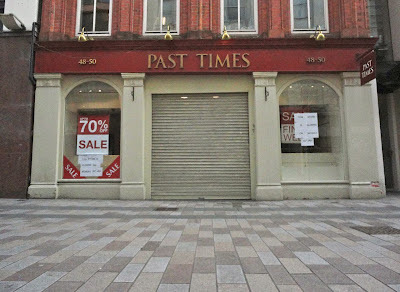 When Occupy Belfast was feeding turkey to the homeless on Christmas Day and New Year’s Day, where was the church? When the service of Nine Lessons and Carols finished, why didn’t the choir walk down the aisle, out the door, down the steps and over the road to bring some impromptu Christmas cheer to the Occupy camp? Where was the hastily thrown together programme of talks and debates looking at the themes being raised by the camp, nearly all of which chime with core Christian values? Hope. That used to be something churches and the Christians in them spoke about. Collaboration, sharing ideas and spreading best practice are common to most jobs, whether organised through formal structures or informal conversations. The first TeachMeet session in Northern Ireland is being run in Stranmillis University College on Friday evening. TeachMeet is an ‘un-conference’ format that runs in many other locations, with primary and post-primary teachers coming together to share with colleagues and take home other people’s ideas. Attendees can sign up on the night to give a 2 or 7 minute presentation on a topic of their choice: amusing, amazing, questioning or enthusing. The organisers suggest that “with the ever-shrinking education budget on the horizon … this will be an excellent free Continuing Professional Development (CPD) opportunity for teachers”. They also note that presentations given do not have to be ICT-themed. Friday 2 March between 6pm and 8.30pm in the Centre of Excellence for Leadership, Innovation and Learning at Stranmillis University College. 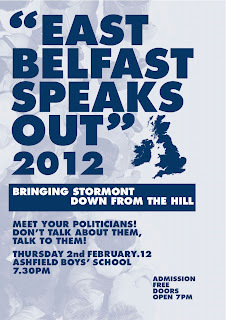 The event should be streamed online for those unable to make it to Belfast. More information on the TeachMeet Belfast website, Twitter feed and Facebook page. Belfast Children’s Festival is back after an absence with a week of events aimed at weans aged zero and up. Some old favourites are back. Belfast Waterfront is hosting the Baby Rave for toddlers and their parents on Saturday 10 and Sunday 11. Cost £5. Cardboard Cities is back, this time in the Assembly Rooms. All ages of children (that includes you!) can adapt and rebuild the cardboard city using the supplied raw material. Friday 9 (3-6pm); Saturday 10 and Friday 16 (11am-6pm). Free. Probably my favourite sessions from previous Belfast Children’s Festivals have been Tea and Tales / Sos agus Scéalta. Boxes of books (in English and Irish) and comfy beanbags. Heaven. This year in Assembly Rooms. Drop in on Saturday 10-Friday 16. Free. The NI Housing Executive are sponsoring My House: a special house with a furry ceiling where the rooms and chimneys change and grow. A theatrical experience suitable for 18 month to 3 year olds to explore with all five senses. Crescent Arts Centre, Thursday 15-Friday 16. Cost £5. Once Upon A Time is for 5-9 year olds who will help “the Very Trusted and Nearly Excellent Guardians of Tall Tales and Small Stories” find the last missing story after a fire destroyed their Most Extraordinary Wonderful and Magical Library. Assembly Rooms, Thursday 15. Cost £5. Fancy some opera? Spark Opera Bites in association with NI Opera’s Young Artist Programme presents two short works – The Monster in the Dark and Science – for 7-11 year olds in the Harty Room at Queen’s University. Wednesday 14. Cost £3. The wonderful Wireless Mystery Theatre company are performing Orson Welles’ War of the Worlds in the Studio Cinema belonging to Northern Visions and Belfast Film Festival above Belfast Exposed. Sunday 11 at 3.30pm and 7.30pm. 9-12 years. Cost £5. Recommended. The Waterfront is also the venue for four family films over the festival’s opening weekend: FernGully (Sat 1.30pm), Up (Sat 4pm), Ponyo (Sun 1.30pm) and Fantastic Mr Fox (Sun 4pm). Cost £3. QUB Sonic Arts Research Centre is hosting a two day workshop in its world-beating centre which truly offers surround sound. Children aged 9-12 will work with doctoral students to develop a piece of sonic art. There’s a live showcase – Big Ears Sonic Arts for Public Ears – on Sunday 11 at 3pm. Workshop £20. Showcase £5. Two hour Stop Motion Animation sessions in the Belfast Waterfront on Saturday 10 and Sun 11 (12.30-2.30pm, 3-5pm). For 6 years and older. Make your own mini-movie. Cost £7. It’s 2020 and the Irish unification that unionists and loyalists confidently predicted would never happen has become a reality. President Adams is ensconced in Phoenix Park. A group of men from a Lurgan church meet regularly for Bible study. The societal events around them are shaking their faith and challenging their identity as they adapt to these new norms. 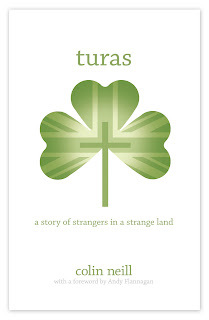 Irish for ‘journey’, Turas is a novel written by new author Colin Neill. I reviewed it last year in a blog post and included a brief Q&A with Colin. Colin and his novel are the focus of Contemporary Christianity’s next In Conversation event at 7.30pm on Tuesday 21 February in a session entitled Imagining a united Ireland: the novelist's opportunity. Excerpts from turas – a story of strangers in a strange land will be read as well as lots of discussion. You don't need to have read the book in order to attend! It’s a free event and everyone is welcome. Tea/coffee and biscuits beforehand and afterwards. Up on the third floor at 21 Ormeau Avenue, Belfast. Update - the audio from Colin's talk is now embedded below. He spoke about his Christian journey, the particular influence of the shared chaplaincy at UUJ, as well as the structure of the book's plot. Festival of History & Broadcasting - Tue 21-Thu 23 February in Belfast ... and it's free! In association with the Heritage Lottery Fund, BBC Northern Ireland are running a series of talks and events next week in Broadcasting House (Ormeau Avenue) combining the subjects of history and broadcasting. BBC NI has a growing track record of producing history programmes for BBC Four and BBC Two, as well as examining the twists and turns of events on this island. We will be ranging across centuries, continents and ways of thinking about history and will be featuring lots of programme clips and recordings. Our aim is to have a big local conversation about the past and why it still matters today. Carlo Gébler, Pat Thane and Keith Jeffrey – Does History Matter? I gave up history at the age of 14. Keeping on three sciences meant that it was a straight choice between geography and history. As a result, my knowledge of history is confined to the legend of Finn McCool, the Roundheads and the Cavaliers, and a link between the assassination of Archduke Franz Ferdinand in an open top charabanc and the start of the First World War. Maybe if Horrible Histories had been around twenty five years ago I might have been lured into the understanding the world of the past? My young daughter reads little else at the moment. If you’re a history buff, or just interesting in exploring the ideas, asking questions and listening to other opinions, head over the BBC Events website where you can register for free tickets. The Alternative Wedding Fair is back this weekend in Crescent Arts Centre. Between 1pm and 5pm on Sunday 19 February, and with a dowry entrance fee of £5, you can catch up suppliers of cards, cake, flowers, music, glitz, photography, vehicles and venues. There'll be a Yum Yum room, a Rock and Roll room and a mysteriously-named Lumi Room. Before the last fair, I asked organiser Cate Conway whether conservative Northern Ireland had a market for for novel adaptions of the often very traditional wedding? Would the myriad of options and personalisation offered at the fair not just add to the stress many people experience around the need for a 'perfect' wedding? No not at all. The 'perfect' wedding is different for everyone. For some people their day will only be perfect if they've spent £1000 on chair covers. For some people it will only be perfect if they have Pac Man cufflinks! We want them to sit and think clearly about what they really, really must have on the day ... using their own brains, not influenced by the magazines or people trying to stick the arm in. We want to encourage people to forget everything they already know about weddings and plan a party that celebrates the fact that they are committing their life to another person. No matter your views on the need for alternative wedding glitz and glamour, the fair is certainly a demonstration of small businesses pitching creatively at the local market. PS: The cake in the photo above is oreo-cookie flavoured and the product of Crumbs Cakes in Belfast! This evening a combination of OFMDFM, DFP and DSD came together to announce that £200,000 unallocated after the January Monitoring round is being made available from DFP to extend the Laganside Events Grant for one further year. The Department of Finance & Personnel statement details two conditions on the funding being made available. (ii) that DSD and DCAL work together to identify a clear policy framework for continuing grant assistance to LEG. Letters sent out by the Department for Social Development two weeks ago had– without consultation – withdrawn the possibility of the Laganside Events funding continuing past the end of March. However, this evening, the DSD Minister Nelson McCausland also found an additional £50,000 within his department to make a total of £250,000 – taking it back down to the 2010 levels from a peak in 2011 of £300,000. It is important that those groups who have received this grant previously now work to achieve long term financial sustainability and move away from reliance on public funding. I hope to engage in the coming weeks with the Cathedral Quarter groups to explore how best to achieve this necessary objective, given the current economic climate. We very much welcome the way in which a number of government departments have worked together with the Department for Social Development in the last number of days to find ways to restore this funding and preserve a unique part of Belfast city centre. Festivals like Festival of Fools and Cathedral Quarter Arts Festival that were already being programmed for the months after the current fund ends are much more likely to be able to go ahead with their planned events, assuming they qualify for assistance under the terms of that DSD will set (and DFP have already indicated). 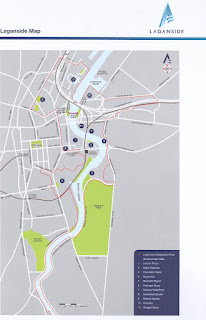 The challenge for groups right across the Laganside Area – and not just the most vocal Cathedral Quarter arts groups – is now to use the year’s notice to replan their budgets for next year in the knowledge that the current Laganside Events fund will not be in place. Can you supply a list of the organisations who benefited from the 2011/12 round of funding through the Laganside Events Grant and Laganside Community Activity Grant, along with the value of the grant awarded. How much has DSD given in 'Laganside' grants since the Laganside Corporation ceased and the department launched its Laganside Grant packages? Liverpool may have singing bins, but Belfast has gone one better with its singing bin men street cleaning operatives. 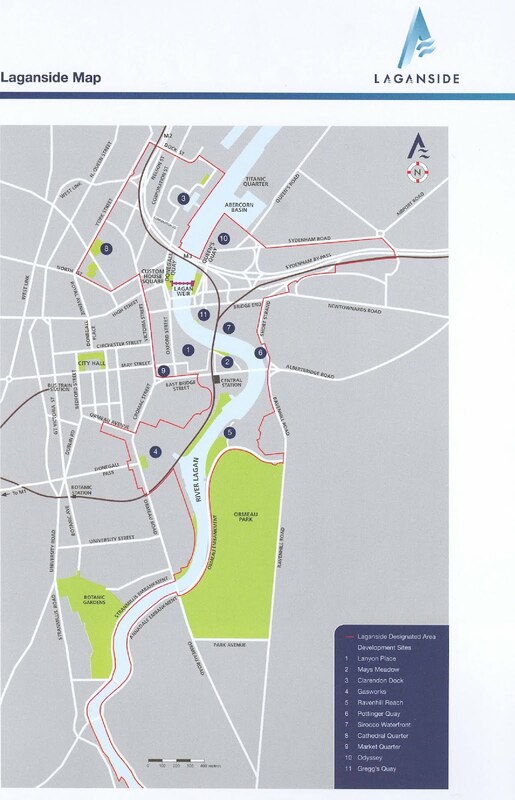 Belfast City Council is currently running a number of anti-litter campaigns. Taking a short-cut up Lombard Street on the way back towards the Cathedral Quarter at lunchtime, we bumped into this tuneful team who were out spreading the message ... and helium balloons. Local games company Billy Goat Entertainment launched their new iPhone game Outfoxed™ on Thursday night in their Belfast office. 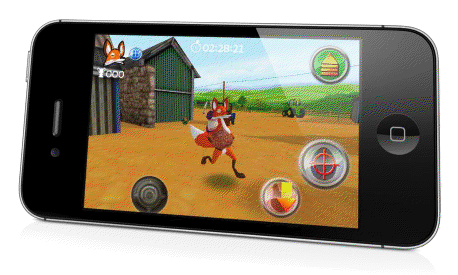 It’s a 3D platform game that puts you in the shoes paws of a crafty fox that is raiding the local chicken farm for lunch. Watch out for the knife-wielding farmer’s wife, or the owner himself brandishing a shotgun. Get past them and you'll have to dodge the hounds. With a desire to use local talent, animator William Barr turned to fellow Ballymena man Jackie Fullerton (sports commentator and silver fox) to provide the distinctive and distinguished voice-over. As the fox moves around farm, Jackie chips in with witty one-liners that could soon become his catchphrases. Check out the video to see a demo of the video and hear Jackie and William discuss Outfoxed™ as well as the state of the local games industry which is steadily expanding, with a couple of small companies making a mark in the iPhone app/games scene already. Billy Goat received seed corn funding from the Creative Industries Innovation Fund (administered by the Arts Council NI for DCAL). Outfoxed™ has now launched on the iTunes Apps Store and is compatible with iPhone, iPod Touch and iPad. There are plans to port the game to Mac and PC too. Priced at £1.49, Pocket Gamer website describes it as “chicken pickin’ good”. With the current incumbent only eight months into the role, Presbyterians select the next Moderator each year in February. Rev Roy Patton topped the poll earlier tonight when each of the nineteen Presbyteries (regional clusters of ministers and their representative elders) met to independently nominate one of the five candidates. The Moderator chairs the annual General Assembly – which will meet a week early this year at the end of May (due to the Queen's Diamond Jubilee holidays). Throughout the rest of the year, the moderator acts as a kind of ambassador for the denomination, visiting congregations across Ireland, as well as trips to overseas churches partnered with PCI and participation in civic events. In previous years, if there was a tie at the February meeting of Presbytery, a second round of voting – a run-off – would be held in March. This year, the procedure has changed, and in the event of a tie, the run-off vote would have been conducted this evening. Tonight, that wasn’t necessary. Rev Roy Patton has been minister of the Ballygilbert congregation (on the main Belfast to Bangor road) for the last 17 years. Born in 1953 into a Monaghan farming family, he studied History, Philosophy and New Testament in Trinity College, Dublin and theology in New College in Edinburgh. Like all PCI ministers, he completed his training at Union Theological College. He was ordained as assistant minister in St Enoch’s (1981), before receiving a call from Downshire Road congregation in Newry (1983). Along with his wife Daphne, Mr Patton has led church teams to Malawi, Kenya and Romania. 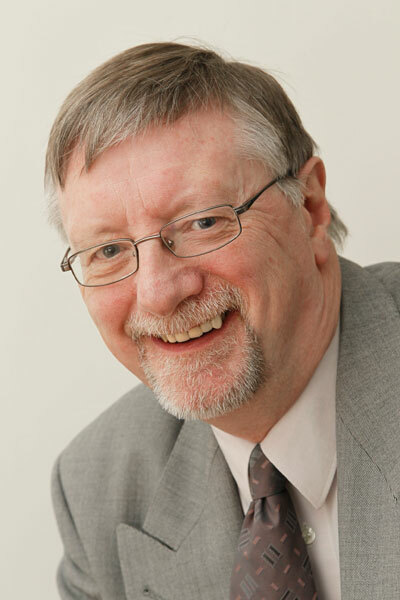 Within the denomination, he has been the convener of the denomination’s Board of Mission in Ireland since 2006, encouraging local congregations to be more mission minded in reaching out to their local communities. The outgoing and incoming moderators appeared on the blog last June when I interviewed them a couple of days before the opening of the General Assembly week. Strains of piano music lilted across Lisburn Library this afternoon as Littl'un and I were in changing her books. Every third Saturday afternoon, for an hour at 2pm, librarian Ray Robinson organises a Lift the Lid piano open hour up on the second floor of Lisburn Library. Members of the public - old and young - sit around and take a turn at playing a short piece on the library's baby grand piano. This week had a 5 year old beginner, accomplished teens and twenty year olds, a mother, and some more mature performers with a liking for jazz. There was even a cellist. And if you don't play - or you're shy - it's ok to just sit and listen. 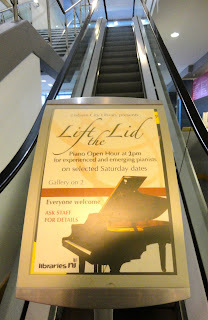 Lift the Lid isn't listed on the Library NI website. But if Ray's rota remains regular, the next afternoon of tinkling the ivories will be Saturday 25 February at 2pm. And if you want to be sure, give him a ring on (028) 9266 9345 and he'll confirm the date. For AiB readers who don't catch my posts on Slugger O'Toole, Belfast readers may be interested to hear about the East Belfast Speaks Out community hustings event which was back for a third year on Thursday evening. Having eliminated the warm up act, this year it was straight into questions after a brief introduction from chairperson Mark Devenport. Women were under-represented on the panel – though Chris Lyttle was a late substitute for Judith Cochrane who was originally meant to be representing Alliance. However, the audience was very mixed, and my recollection is that a shade more than half the questions came from women in the packed school assembly hall. Avoiding the pitfall of allowing each panellist to comment on each question, panel were steered through an enormous number of questions. What’s been done to help young males in East Belfast? Educational underachievement in (Protestant) males. Why is doing 4 or 5 exams in a strange school better than sitting 2 in a familiar place? Increasing number of unemployed graduates. Cutting school budgets and the SEN review. Integrated education rather than sectarianism. Supergrass trials again, brought up this time by a representative from FAST. Difficulty a family faced getting suitable rented accommodation when their child was ill and had to use a wheelchair. Young people leaving NI to study elsewhere. Drama came in the form of an intervention from Occupy Belfast. Reading from several pages of notes, the man asked about Iris Robinson and a sum of £5,000 before going on to decry politicians over the course of the next few minutes. John O’Dowd’s challenges to him proved too much and the gentleman left the hall of his own accord. The protester's performance unfortunately did little to bring credit to the Occupy movement, nor to highlight any of the group’s issues in a manner that would encourage members of the audience to explore them. 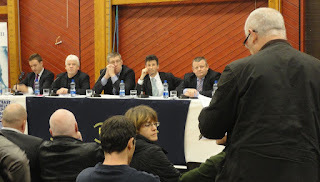 Jenny Muir has an excellent summary of the evening’s event on her blog – East Belfast Diary. Kudos to James Smyth and his team for pulling together the event and handing over control to those who attended. Of course, you'd hope the result of the previous post wouldn't turn into this cartoon from Reverend Fun!